I started reading this book, but with BBAW I was unable to finish it. I also found the part of the book I read to be slow, which is highly unusual for Ted Dekker in my opinion. I do have a pretty awesome giveaway, though, courtesy of Thomas Nelson (they also sent me one! I've already worn it!) the publisher. I can't think of anything more nerdily delightful than a bookish T-shirt for a BBAW giveaway can you? This story is for everyone--but not everyone is for this story. It is a dangerous tale of times past. A torrid love story full of deep seduction. A story of terrible longing and bold sacrifice. Then as now, evil begins its courtship cloaked in light. And the heart embraces what it should flee. Forgetting it once had a truer lover. With a kiss, evil will ravage body, soul, and mind. Yet there remains hope, because the heart knows no bounds. Love will prove greater than lust. Sacrifice will overcome seduction. And blood will flow. Because the battle for the heart is always violently opposed. For those desperate to drink deep from this fountain of life, enter. But remember, not everyone is for this story. 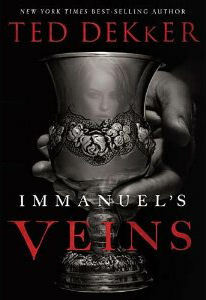 For a chance to win a t-shirt celebrating Immanuel's Veins, which you can view here along with an actual review courtesy of Deborah, please leave a comment with and tell me what you think sacrificial love is. North American addresses only, I'll choose a winner on Sunday! The publisher sent me both a copy of this book and a t-shirt.